I began working with one-on-one with a Pilates instructor in August 2008, just 15 months after I had an artificial cervical disk replacement in my neck. In an effort to regain the strength I lost as a result of the surgery I was told to try Pilates (since physical therapy alone wasn’t cutting it). At first I worked with a trainer every Thursday afternoon. Once I began to see results (i.e., getting stronger, not a “Madonna Body”), I increased my training sessions to twice a week. When I moved to Pennsylvania in July 2009, I started doing Pilates three times a week. While I still have neck and back issues I have to deal with (I knew that the surgery I had wouldn’t solve all of the neck and back problems I had. ), Pilates has certainly helped me to increase my strength and flexibility, which allows me to have a better quality of life. Earlier this year my Pilates instructor and I each had our first child so we both stopped doing Pilates for a few months. In May, she returned to teaching Pilates once a week, which left me trying to figure out how to get in three workouts a week. Thanks to some schedule juggling I’ve been able to resume three workouts each week by taking group Reformer classes on the other two days. However, taking classes with instructors who didn’t know me as well as my regular instructor knew me initially presented a challenge. The other instructors had seen me in the Pilates studio and may have done a make-up session for me here and there, but they weren’t as familiar with my neck and back issues. Therefore, over time, they learned what I could and couldn’t do in classes. They will often say, “feel free to modify this exercise by…” in order to remind me that it’s okay to make some changes so I can participate. Now that I’ve been working with them for awhile classes are going more smoothly. For instance, they know I’m unable to “climb a tree” on the reformer, so they usually eliminate it from the entire class’s workout. This is nice, for me, since it doesn’t leave me feeling left out while everybody else is doing something I cannot do. However, it’s not possible for the instructors to modify the entire class around my needs. Since I’ve been doing Pilates for over three years (and know what my limitations are), I modify exercises as needed. For instance, I cannot hold my head up for very long when the class does eight to ten repetitions of “double leg stretch” so I keep my head down on the mat. Something similar happens when I do the “lower-lift” mat exercise. I keep my head down, with my hands under my lower back, and <<diamond>> my legs. 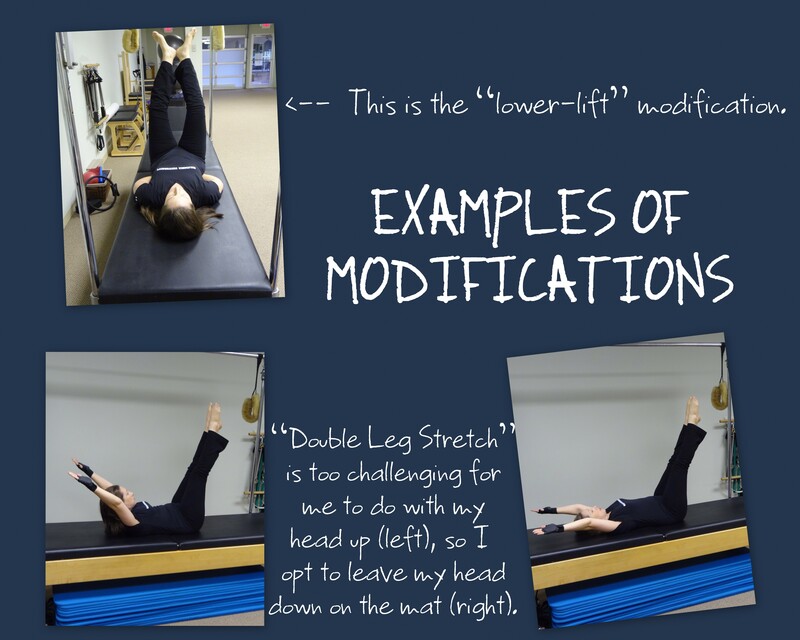 These modifications make the “lower-lift” exercise look very different from my peers’ form on this exercise, but the modifications I do eliminate strain on my body. Modifications are necessary for me to keep up with the other class members without having to sit on the equipment waiting around for an exercise I can completely do. When I was in Reformer class last week my mind began wandering from doing Pilates to the teaching of writing. The modifications the instructors encourage me to do in Pilates are similar to the modifications teachers of writing provide to their students. I’ve taught writers who struggle with organization. These children have needed graphic organizers or other tools to help them organize their thoughts. I once taught a child who was in great need of a word prediction program. This child knew what he wanted to say, but the physical act of writing was too challenging for him due to some OT issues. (While he didn’t receive this software when he was in my class, the school was able to obtain it for him the following school year.) I’ve taught children who had massive trouble using conventional spelling. 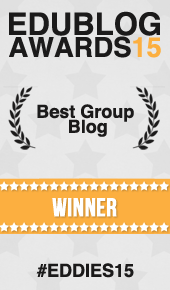 Therefore, pairing them up with an editing partner to help them proofread was helpful. There have been times I’ve altered my expectations for the final published piece of writing (e.g., instead of a five paragraph essay I received a three paragraph essay, instead of eight poems in a poetry portfolio there were only five) because of a students’ limitations with regard to the writing process. While I never wanted to fall into the trap of doing the work for my students or having low standards, I was open to working with my students to help them overcome their challenges so they could feel successful in the writing workshops I led. Appropriate modifications were always key to making this happen. When I leave each and every Pilates class I feel successful. I not only feel stronger, but internally I am proud of myself for being able to keep up with the other women because of the modifications that are available to me. I am not the strongest or most flexible person in the classes I take, nor do I have a rock-solid body like Kelly Ripa. However, I am able to accomplish many of the same things, by tweaking things here and there, as my peers do when I take Pilates classes. It’s my hope that all kids feel the same way about writing workshop. The best way for this to happen is by removing stumbling blocks and modifying things so each and every student can become a successful writer. How do you remove stumbling blocks for students in your writing workshop? What do you do to modify assignments or conditions to help your students become better writers? I think what I have seen posted sounds familiar. The tips or modifications I give students depends upon their specific need. In kindergarten, paper choice is part of helping young writers. Some have lots of space for illustration and one or two lines for words. Another way to modify for young kids is to be the kind of teacher that accepts approximations from students. When you have been conferring with kids and know them well, you know which approximations are signs of growth. I also dont expect all kids to generate the same number of drafts. Christy and Linda, you both raise very valid points regarding students’ ability to grow from their individual starting points based on the scaffolding that we provide as teachers. I am currently in Grad School working towards a degree in Secondary English Ed, and even at this level I have seen my writing skills develop significantly over the past two years as I “stretch” my mind and push myself beyond my current abilities as a writer. I really appreciate Stacey’s analogy. Stacey, I learned something today reading your post! I had not heard of Word Prediction software until today, and after reading up on it a bit, it sounds like an amazing program to help develop writing skills in students who need more help than a teacher alone can provide, particularly in the traditional classroom. I am curious to know if you were able to keep tabs on the student who eventually gained access to this software; do you know its impact on his writing aptitude? I actually posed the question to a group of middle grade teachers today as we talked about growing independent writers. We all agreed that it depends on the student’s needs what you choose to do. It might be more help with organizing thoughts and that might point to visualizing, but another child might need some modeling one on one from the teacher, or practice in a group. It depends. Just as you work from your strengths in order to improve, so do the students, with help from a variety of sources. Certainly the things you mentioned, like graphic organizers specifically designed to suit a student-writer’s needs are part of my process, but I think writing workshop itself is naturally differentiated. Each student writes towards the same goal, but the starting point is always different. The whole idea of individual conferences makes it so that every writer is pushed to grow from his or her own comfort level. It is like providing natural scaffolding. Just like when you participate in pilates using a modified position, the idea is that if you keep working at that one position, you will grow beyond that point because you will build strength and stamina. You may never reach the flexibility level of rubberman (or the advanced person stretching and balancing next to you in class who doesn’t have neck or back issues), but you grow from your own starting point. That’s what conferences do for our student writers.